Let’s start the week on a healthy note with this yummy but nutritious dinner of soothing Pumpkin Soup and sumptuous Bajra, Carrot and Onion Uttapa. The Pumpkin Soup is a low-calorie delight with a very elegant, soul-warming flavour. The Bajra Carrot and Onion Uttapa is a unique adaptation of the famous Uttapa, made with soaked and cooked bajra and bajra flour, perked up with veggies and ingredients like green chillies and coriander that perk up its flavour. The batter for this Uttapa does not require fermentation, however you have to remember to soak the bajra ahead and also provide for the pressure-cooking time. This tasty snack can be served with healthy green chutney to make a wholesome dinner. Tuesday is just the right day to pamper yourself and your family with a flavourful dinner of Garlic Cheese Naan and Paneer Pasanda. The Garlic Cheese Naan is an interesting Indian bread, with a pungent, cheesy taste and authentic texture. However, it is quite easy to make – it does not require yeast and is cooked on a tava, making it simple enough to make on any day. The Paneer Pasanda is an equally rich delight, with a spicy flavour and creamy mouth-feel. They are quite apt to serve together. Let’s reach out to our roots on Wednesday, with a traditional and homely meal of Bhakri and Doodhi and Chana Dal Subzi. Bhakri is one totally homely Indian bread with a rustic flavour and texture, which will remind you of home and mom’s love wherever in the world you are! Doodhi and Chana Dal Subzi matches perfectly with its light and pleasant flavour and mouth-feel. It is a no-fuss, no-sweat recipe that you can prepare quickly and easily if you have soaked the dal earlier. Everybody needs a snazzy, totally peppy dinner on Thursday to re-energize their body and mind! So, start with an off-beat, awesomely tasty Moong Sprouts and Potato Salli Chaat. Made with potato salli and crunchy sprouts, laced with curd, chutneys and spice powders, this chaat has a tongue-tickling flavour and exciting mouth-feel that you will enjoy. 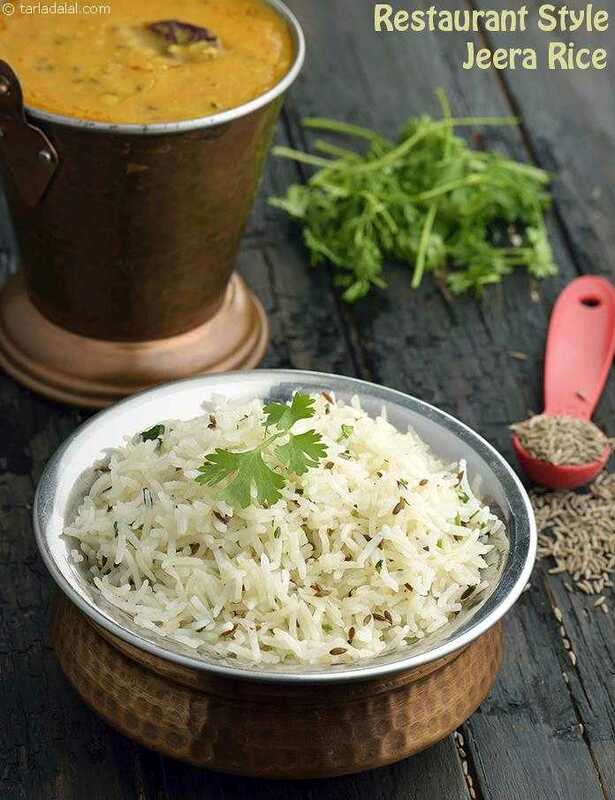 Go on, to enjoy a Restaurant Style Jeera Rice and delightfully rich Dal Moghlai. Like all things from the Mughal era, this dal too does have a rich taste, but it is surprisingly easy to make and is not too heavy either, allowing you to include it as part of your everyday menus. One-dish meals are ideal for Friday. After a long and tiring week, you also feel like relaxing a bit before the weekend fun begins! However, you need to pick the one-dish meal in such a way that it is exotic and exciting, just right to ring in the weekend. A traditional one-dish meal from the kitchens of Tamil Nadu, the Sambhar Rice is enjoyed so much by them that it is made on special occasions as well as lazy weekends!